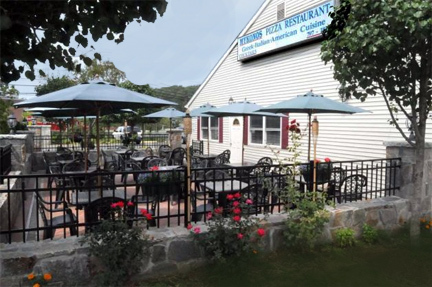 As we are Celebrating Our 35th Anniversary for MYKONOS RESTAURANT, we are now in our new building at the corner of Rowan St. and Hayestown Road, just down the street from our old location. We would like to Thank all of you our customers for the support that you have given us over the years and welcome any new ones. MYKONOS FAMILY RESTAURANT, is open seven days a week for your convenience, offering many traditional Greek Dishes hard to found anywhere else - - such as Mousaka, Spanakopita, Tyropita, Pastitsio, Beef Stew Greek style (Kokinisto Casserole), Roasted Lamb, Gyros Souvlaki, marinated pork, fresh fish, baked or fried Greek style, plus a wide variety of Italian as well as American dinners ... from Pasta, Chicken and Veal ... to Steaks, Burgers and of course the Best Pizza in Town! From our unique, award winning pizzas such as Seafood Pizza, Mykonos Gyros Pizza, vegetarian house special, or any other combination you would like to choose. We carry a liquor license, with a great selection of Greek, American & Italian wines and we offer full catering and take out service. Please, make MYKONOS PIZZA RESTAURANT your choice for dinning out and let us make your visit . Pleasant, Enjoyable and Memorable!!! We look forward to meeting you and continue serving the best to you for many years in the future.